B. Material: SKD61, was imported in Japan HTTACHI, wth good self resistance and high temperature fatigue resistance, can withstand temperature fusion, suitable for long- term work at high temperature, with good cutting performance and polishing performance. 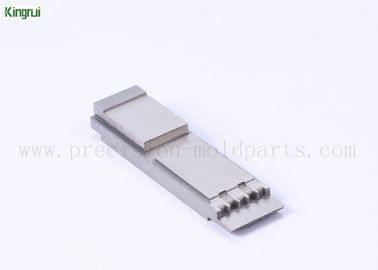 Used in general die-casting mold, zinc die-casting mold, low pressure casting mold, high hardness plastic mold. C. Main Machined/ Technology: Surface grinding and EDM processing. These are the processing strengths of our company. CNC milling/ CNC turning/ grinding/ wire cutting/ EDM& etc. Polishing/ Mirror polishing/ DLC polishing/ PVD coating and so on. 1. We are specialized in providing customized processing services, so far more than 12 years of processing experience, our processing range mainly is below: precision connector mold parts (auto conenctor, computer connector, mobile connector, medical equipment connector,etc), and industrial cutting tools (paper cutting knife, packing knife, food processing knife) and more.